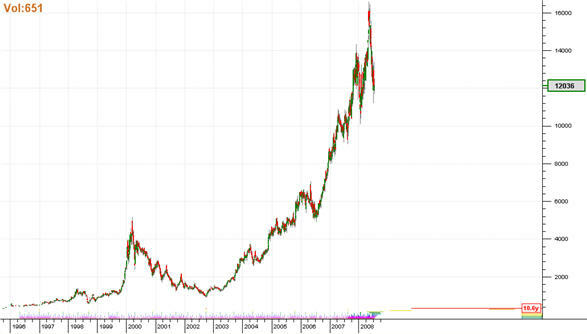 The shape of MTN’s price movement looks fairly familiar … like the rest of the SA stock market, it’s been going UP a lot! It reached a peak as recently as May this year. Since then the price has been falling fairly rapidly. The software is choosing to position the 54-month trough back in August last year, which I think is fairly questionable, however as I have mentioned in other posts, the positioning of the 54-month trough is a tricky business (because it relies on evidence gathered from the 9 year cycle – of which there is very little in the 15 years of data available – about 1 and a 1/2 cycles to be exact). However whether or not the 54-month trough is positioned correctly, there can be little doubt that we are due for a 40-week strong trough as indicated by the inverse gray pyramid to the right of the chart. Notice also the column of question marks positioned on the 3rd of July – the software identifies that day as the expected nest-of-lows, but it is too recent for there to be enough corroborating evidence to firmly declare that as the trough. Price is in the BUY zone (in fact it is pretty late in the buy zone), and the software is forecasting a rise to over 17000. Of course if the positioning of the 54-month trough is incorrect, that will affect the cyclic model the software has built, and will change that forecast to some extent. But the worst that can happen is that the forecast will be lowered and the price will not be as extensive as forecast now. As the price unfolds the software should detect this change, rebuild its cyclic model accordingly, and exit from the trade at a lower price than originally forecast, but likely still at a profit. Time will tell … which is why we’re testing the software in this way! 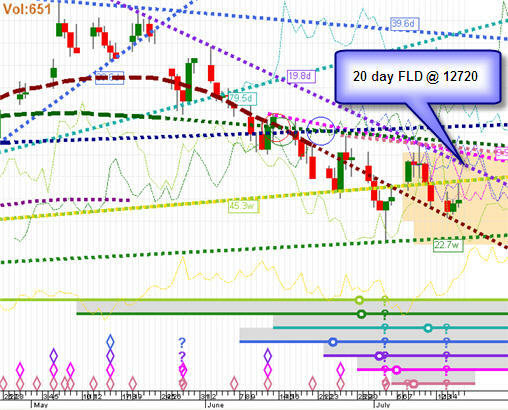 Looking in more detail at the price movement – the 20 day FLD high is at 12720 1 day ahead (the 17th of July). If price crosses this level, that would confirm that we have seen the trough of the 40-day cycle, which by the Principle of Harmonicity implies the expected nest-of-lows occurred on the 3rd of July. 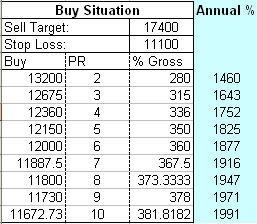 The buy situation reveals that an entry into a long trade at 12720 would have a Potential:Risk ratio of over 2 (which is acceptable), and a gross% return of over 280%, assuming one purchased margined Single Stock Futures in MTN. The annualized percentage is an exorbitant 1460%. However, I must emphasize that I present this analysis in the spirit of testing the software – given the reservations expressed earlier about the positioning of the 54-month trough, this trade must be considered too high risk at the moment. As soon as the software’s Cyclic Model Rating feature is complete I will be able to judge the degree of risk, but that will have to wait a week or two. 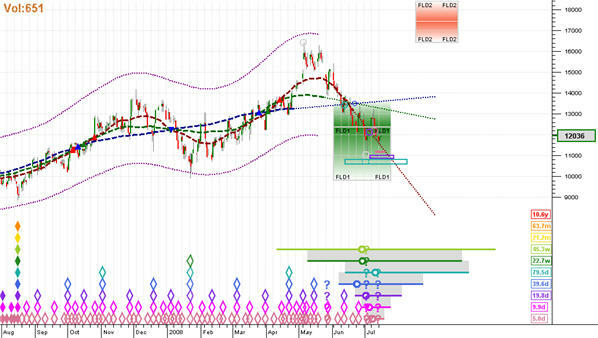 Please note that this is a discussion of the cyclic analysis performed by Thinking Trading Software. It is NOT a recommendation of a trade. All articles and comments on this website are presented as a discussion of the efficacy of the software to analyze the cyclic movement of stock market prices. I am doing this to create a record of analysis by the software over time. DO NOT consider this to be trading advice or recommendation. I am not qualified to offer trading advice … I merely offer this information as a commentary on the software.